We got up around 07:00 and prepared for our big trip in the car! We had cereal for brekky and then finished the packing of our bags that we started in the night. We loaded up the car and said bye to Allison and the kids. The girls were sad to see us go, but we'll see them again for a while in Seattle. Before we left, Allison's sister Tina brought over her younger son for Allison to mind today, and we got to see her very briefly. Before going, Allison gave us a bag of dried fruit and nuts from Cal Yee's - the fruit/nut place we said we might want to visit if we got time, but never managed. She had driven out there yesterday while we were at Sacramento, especially to get some things for us! She got us a bag of large dried fruit, a fruit and nut trail mix, and a bag of pistachios. Then we finished loading the car and started driving. First stop was just down highway 80 to the Jelly Belly factory in Fairfield. We got on the 09:30 guided tour but, unfortunately, they were doing inventory today and weren't making any jelly beans. But the tour was still interesting and we got small sample bags of Jelly Bellies and the new JBZ chocolates at the end. Then we browsed the store there and bought some souvenirs, some Jelly Bellies to eat in the car, and three 2-pound bags of Belly Flops - the misshapen beans removed from the production line and sold for half price. The proper beans were $7 a pound, the flops $7 for 2 pounds, or $5 per 2 pounds for three or more 2-pound bags. Having taken care of this essential bit of business, we set out on the long drive to Yosemite. We took highway 12 east and stopped in Rio Vista for an early lunch at a Subway. Michelle had a Veggie Delite on honey/oat bread and I got a meatball marinara on sourdough - but the dough wasn't really sour like the proper San Francisco sourdough. Michelle saved half of hers for later. We also got cups of iced water for drinking in the car. Then we walked two doors down to a supermarket and bought some fresh apples for snacks. We continued down highway 12 until we turned south at highway 99, then followed that to 120 east. Along this road the scenery started to change, becoming more hilly, then mountainous with deep valleys. The road wound around and driving got slow at times. We took the turn south on 49 to Mariposa because I remembered the stunning view one got on emerging from a tunnel of the full majesty of Yosemite Valley and thought this was the road that would have it. We stopped for a toilet break in Mariposa, at a Burger King, and also replenished our ice water supply. Then we set off on the final leg into Yosemite. We passed the town of El Portal and then past the Yosemite National Park entrance gatehouse - where a sign was posted saying that the gatehouse was closed and we could pay our park entry fee of $20 per car on leaving. We drove along the Merced River and the view kept getting better until suddenly I noticed we were nearing El Capitan and hadn't passed any tunnel or obvious valley view. So we stopped and I reviewed the map only to notice we were on the wrong entry road to get the tunnel and the famous Tunnel View lookout. So we continued a bit and turned on to the Wawona road that leads to Tunnel View. 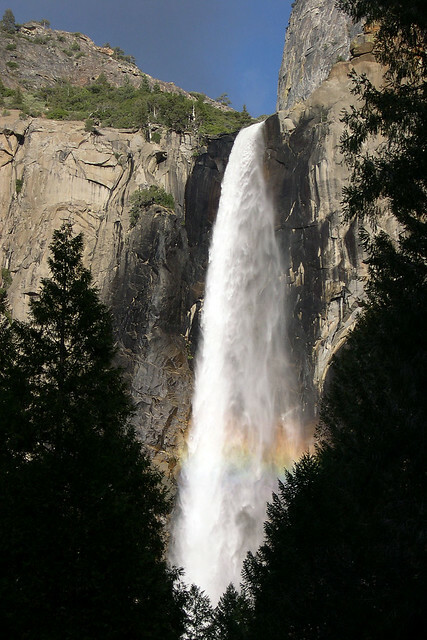 A short distance along we saw a carpark for Bridalveil Fall and decided to stop for a look. After noticing a walking track signposted as leading to the falls vista point, I asked a man returning how far it was. He replied that it was 5 minutes, but easily the best 5 minute walk he'd ever taken. He also said it was very wet, with mist from the falls, and advised us to take raincoats or umbrellas. So warned, we walked the short trail to the bottom of the falls, where it was indeed like standing in a misty rain. It was cold and we didn't spend long there, but got a couple of quick photos. The we returned to the car and drove up to Tunnel View, where the view was as magnificent as I remembered. Some photographers were there with tripods and medium/large format cameras, waiting for the sunset. After taking a few shots I asked them when the sunset would be and they indicated in half an hour or so. So we stayed there until then and then the sun slowly sank to the west and generated a glorious warm light on the valley. After snapping several shots of it one photographer said that he'd been there every night for the past eight days and this was the best sunset light he'd seen. We asked a guy to take our photo in front of it and it turned out he was from Melbourne - he was surprised to hear our Aussie accents. In the growing dusk we drove down to our accommodation at Yosemite Valley Lodge. Our room wasn't quite ready, so we went to the food court there to have dinner - it was essentially a big cafeteria. We checked out the menu for the lodge restaurant, but at $16.75 for a veg lasagne, the food court seemed a much better deal. We got pizzas - vege supreme for Michelle and pepperoni for me - plus a bowl of chile con carne for me, a hot chocolate for Michelle, and two small cartons of milk for breakfast, all for $20.04, less than that vege lasagne plus tax and tip! Then we got our room keys, checked the room out, got ice in a bucket to keep our milk cold overnight, and unloaded our stuff from the car. 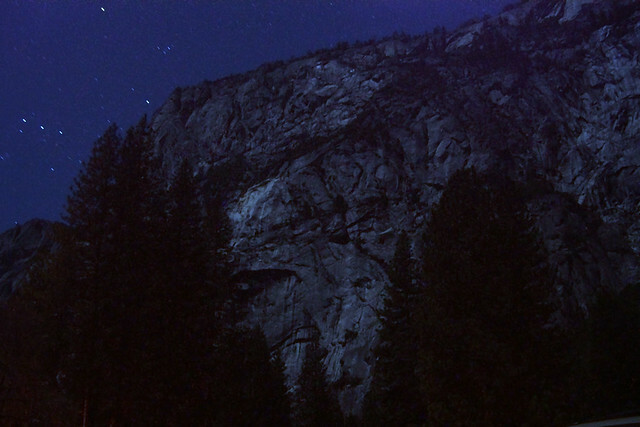 Then we went outside to take some time exposures of the rock face above the lodge, lot only by the moonlight. Came back to the room and had an apple as I wrote up today's diary. Last updated: Thursday, 24 January, 2019; 00:18:31 PST.